You are invited to join the fun rain or shine from 8:00am – 4:00pm! Stroll the park and admire vehicles in 42 classes! Enjoy the music, visit with folks, and plan on a great day in beautiful Chandler Park! 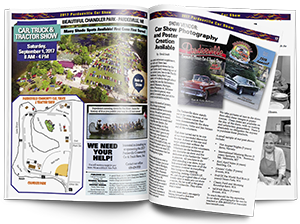 Download our full color 2019 Carshow Magazine, full of stories and great info about the Show.